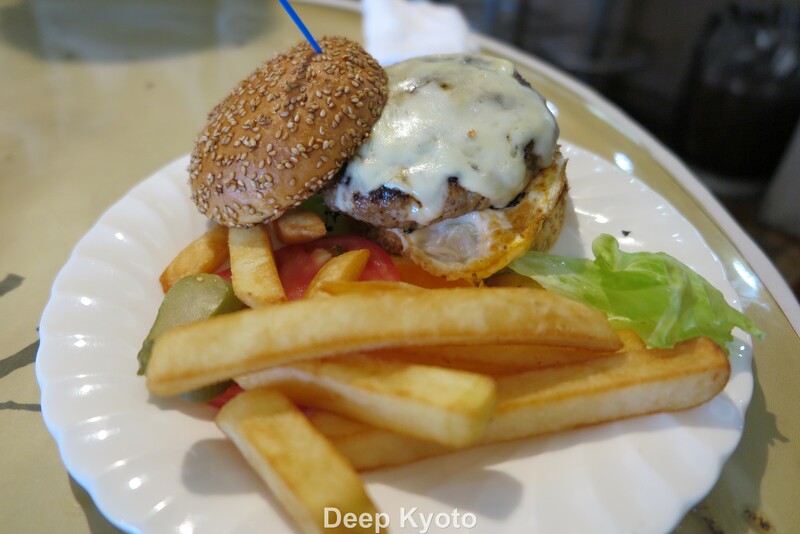 Speak Easy is an American style diner up by Shugakuin Station which is famous for its great range of burgers, breakfasts, and Mexican style food. There used to be another branch of this shop in the town center that Mewby and I would regularly frequent back when we lived in that area. I was a big fan of their vegetarian gluten burgers and their crispy onion rings and I was most disappointed when that branch closed down. Sometimes you just get a hankering for quality junk food, and my hankering was thwarted. And Shugakuin is just a little bit out of the way for us these days. 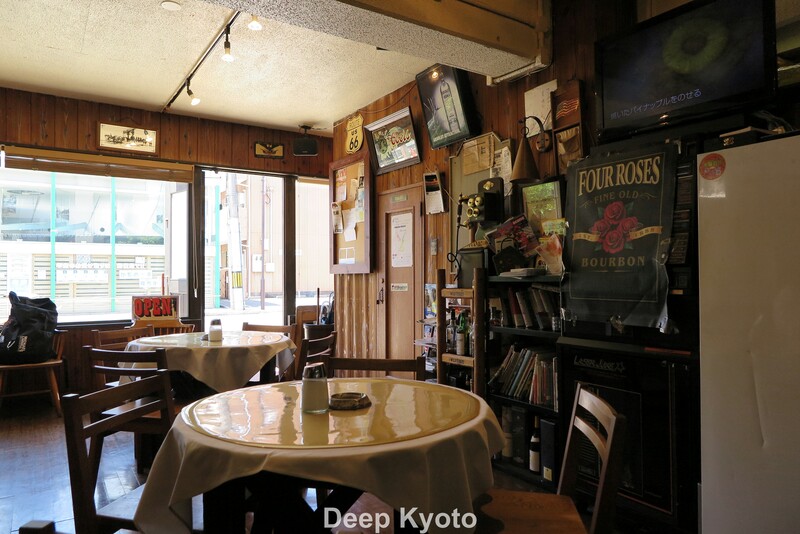 However, we recently booked a tour of the Shugakuin Imperial Villa, and naturally decided we would have lunch at the original Speak Easy afterwards. You can imagine how much I was looking forward to my Speak Easy lunch. As we wandered the stately gardens, admiring ponds and tea houses, all I could think of was of my long-awaited reunion with a good-old Speak Easy gluten burger with pickles and fries and ketchup and of course a side order of those fantastic onion rings. Well established: Speak Easy has been open since 1987. The diner itself is easy enough to find being within shouting distance of the station, and having the Stars and Stripes hanging up outside is certainly a giveaway. Inside the place is decorated with a clutter of retro Americana, and two TV screens have CNN on permanent broadcast. My attention was on the menu however, and I was happy to see that my old friend the gluten burger was still listed on there, along with cheese burgers, chilli burgers, teriyaki burgers, chicken teriyaki burgers, Kyoto burgers (? ), and “special burgers” which come with egg, avocado and bacon. They also have a fine array of sandwiches, pizzas, and Mexican options such as tacos, nachos, and enchiladas. Faced with such choice, what to do? They were out of gluten burgers. I put a brave face on this bitterly disappointing turn of events, and ordered a fish burger instead. It was a perfectly decent fish burger, but obviously it couldn’t make up for my deep sense of loss. In terms of size it wasn’t really up to American standards either. 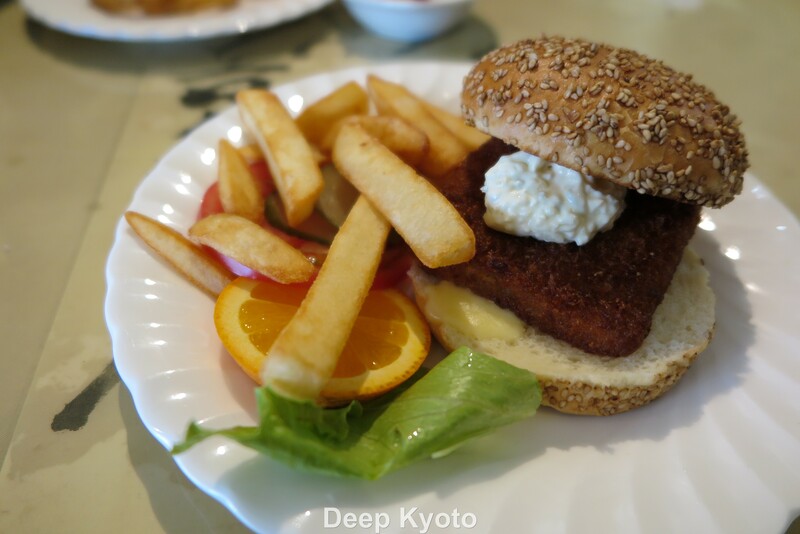 A perfectly decent Speak Easy fish burger. Mewby had a cheese burger with extra egg and she described it as perfectly adequate. Mewby’s cheese burger with extra egg. You can choose fries or onion rings with your burger. 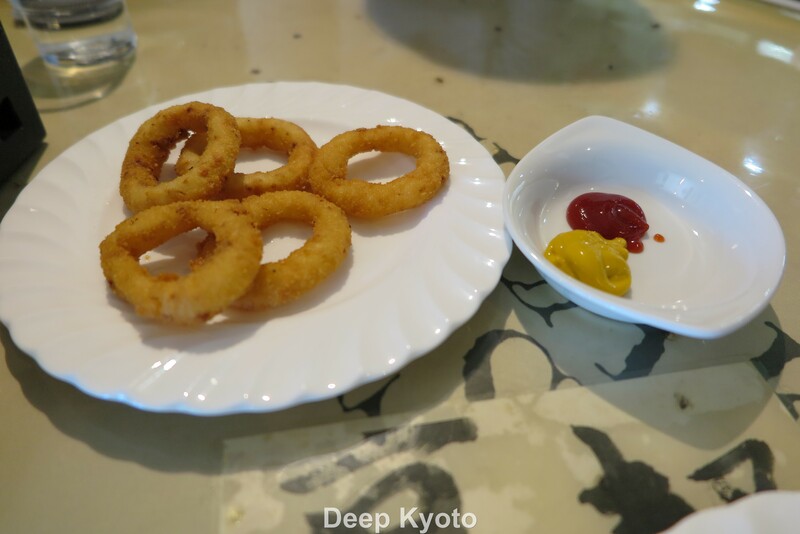 We went for fries but ordered a small side order of onion rings too. Next time I would order large because a small serving really is quite small. An Olympic order of exactly 5 rings. Speak Easy are also well known for their American breakfasts with bacon, eggs, pancakes, and hash browns. It’s a good spot for a quick bite to eat if you are in that neighborhood, but I think next time I go, I’ll call ahead and ask them to check their fridge for gluten burgers. It’s been too long. 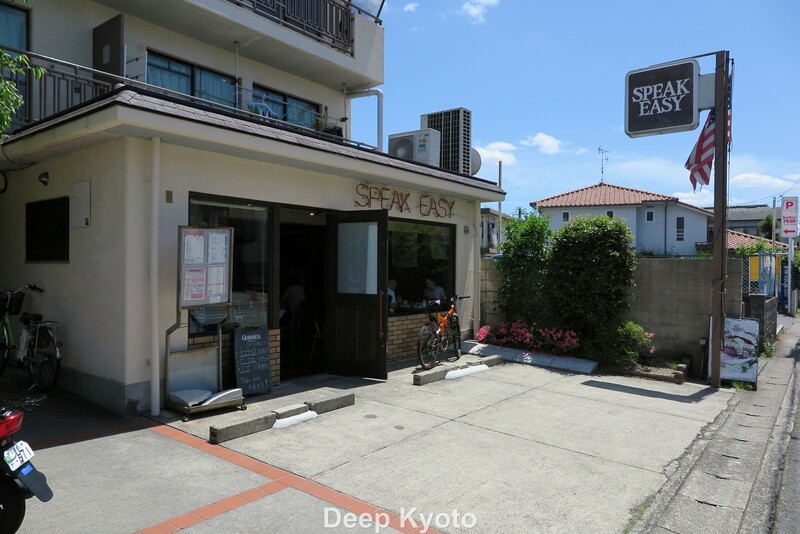 Speak Easy is located on the west side of Shugakuin Station. Here is a MAP of the location.